Over the weekend I found myself in Eugene, Oregon. And while our fresh produce stands and farmers markets in Bend have closed for the season, I was hoping that those in Eugene were still open for a few more weeks. I was in luck. I stopped into Thistledown Farms and picked up my produce for the week (only paying $15 and that includes picking up a bag of Filberts!) (see the entire view on IG Stories if you’re viewing this post on Monday October 23). And then I sought out the local fish market which offered fresh seafood caught off the Oregon coast. Needless to say, I knew something from the sea would be for dinner last night. 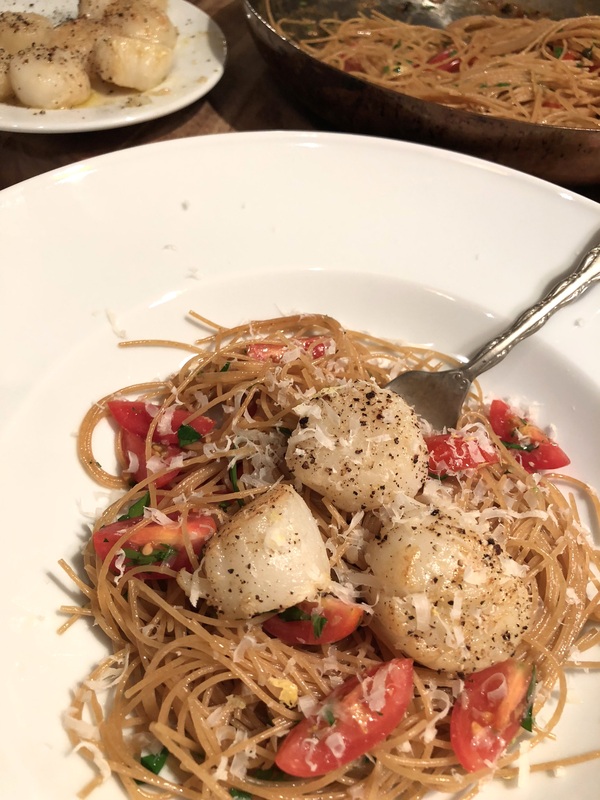 After choosing sea scallops, during the entire drive home, I imagined the recipes I could make that would be simple (as I was exhausted from a full and fun weekend) and full of flavor without being too rich or heavy. 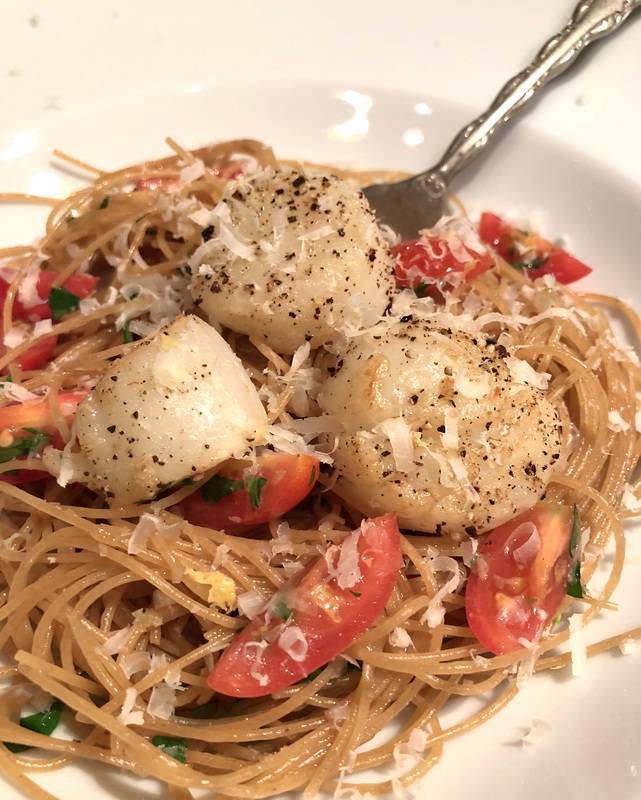 Choosing a recipe that is similar to a shrimp pasta dish I love to make, I came across a Pan Seared Scallop with Butter Lemon and Caper Sauce. In fewer than 20 minutes, dinner can be enjoyed. Perfect to be the meal of choice after a long work day, savor the butter flavor along with the freshness of the lemon and tomatoes. Oh, and of course the prize of each bite is the tender, succulent scallop. Pat dry each scallop. While drying the scallops, heat up a stainless steel skillet to medium heat with two tablespoons of olive oil. Wait for the pan to get hot and the oil begins to make subtle waves. Season both sides of the scallops with salt and place in the pan without crowding. Cook the scallops on the first side and do not move them, enabling them to create a brown finish. After about three minutes, add one tablespoon of butter and turn the scallops and allow the second side to caramelize. This will take about 2 minutes. Turn off the heat, remove the scallops to their own private plate, but keep the pan with the renderings (set aside for now). Bring a large pasta pot to boil. Add salt. While it comes to a boil, make the sauce. Use the pan used to sear the scallops. Turn the heat to medium and add one tablespoon of butter and the garlic. Cook for about 1 minute until the garlic is only lightly brown and the garlic becomes fragrant. Increase the heat to medium-high heat and add the wine. Let the sauce simmer until the wine is reduced by half - about three minutes. Add the chicken broth, lemon juice and capers and turn the heat to high. Cook until the sauce is reduced by half which will take about 8 to 10 minutes. Turn off the heat and add the final tablespoon of butter, whisking to combine. Taste the sauce and then season with salt and pepper to suit your taste. Cook the angel hair pasta. When al dente (about four minutes), drain and add the pasta to the sauce. Add the parsley, lemon zest and the tomatoes. Place the pasta onto the single serving dishes, top with 2-3 scallops and finish with freshly grated Parmesan. ~View more TSLL Pasta recipes here. Looks delicious. I’ll have to try it at home soon. Thanks for the idea! Oh my goodness! Looks delish… I lived in a Eugene for 6 years and how I miss the restaurants and fish markets! After living all over the U.S. I truly believe they have some of the best restaurants. I love Newman’s Fish Market, Cafe Soriah, and Chapala’s. I’m originally from Eugene, 66-years-old. The original Mr. Newman was in Lion’s Club with my father, who was the writer of “The Lion’s Tail.” (monthly Lion’s Club newsletter). He and Mr. Newman were good friends. I remember the Lion’s Club Picnics, where Mr. Newman was always the life of the party. Our family patronised only “Newman’s” for our seafood. I spent a month in Eugene in 2015, not far from their Coburg-Road establishment, which meant more than a fair share of fresh seafood. I live in France now, and despite it’s reputation for fine food, I miss the Pacific NW style cuisine. I’ve never tried scallops but this looks delicious, thanks! I think you will find it to be a lovely combination. 🙂 Enjoy! always looking for a new way to prepare a favorite. this is on the menu for this week and thanks!